Sometimes businesses require a requisition in order to raise a purchase order (PO) and restrict manual PO creation. This blog shows you how to restrict a user from manually creating a PO. Manually by using the PO form. Automatically from a requisition by using the AutoCreate form. Some businesses require a requisition to create a PO and restrict manual PO creation. 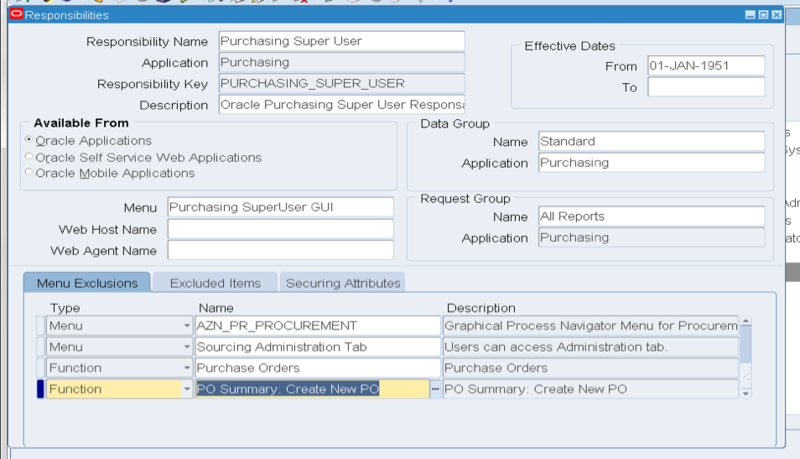 The following sections show options to restrict the manual creation of POs in Oracle E-Business Suite (EBS) applications. This method requires two personalizations, one on the PO Header Block and another on the PO Line Block. To personalize at the PO Header Block, use the WHEN VALIDATE RECORD event, as shown in the following image. To personalize at the PO line level, trap the PO creation in the WHEN NEW BLOCK INSTANCE event. Pass the control to PO Header Block. To use menu exclusions, you need to exclude several functions at the responsibility level to ensure that a user is not able to create the PO manually. Make sure that you modify all responsibilities where you want to restrict PO creation. The limitation with menu exclusions is that a user is not able to edit the POs (which were created through the auto-create functionality) from responsibilities on which functions Purchase Orders and PO Summary: Create New PO are excluded. You can use either of the methods described in this blog to restrict the creation of PO creation. If you want to permit a user to edit the PO after creating it from a requisition, you should use the form personalization method. If the user will create the PO from AutoCreate without needing to edit it, then use the menu exclusion method. I hope you find these hints valuable and are able to put them to good use.